For years the only lighting options available for cabinetry and furniture were the tried and true incandescent or fluorescent fixtures. The choices today include lights that are not just economical to use but are also good for the environment. The information below will help you make an informed decision as you choose lighting for your cabinets, furniture or showcases. Task lighting, as the name suggests, provides lighting for tasks like reading, cooking, playing games or working on your computer. The lights are usually brighter in nature to prevent eye strain and are directed at work areas like kitchen counter-tops, desks and computer stations to make it easier to focus on a particular task. Additionally, these lights never have distracting glares or cast shadows that would interfere with a work space. Although portable lamps can achieve task lighting, home designers often use recessed or track lighting for task applications as these types of lighting blend nicely with home décor. Accent lighting, on the other hand, focuses a higher concentration of lighting on particular area or subject so as to create a visual centerpiece or point of interest. For instance, accent lighting may be used to highlight a sculpture, painting, display case or architectural feature. In order to properly highlight a point of interest, the accent light pointing to it should be about 4 times brighter than the background light. Accent light fixtures usually need to be able to swivel to point directly at their target, but some recessed and track fixtures are available that are suitable for accent lighting. To help compare the brightness of our lights, we've determined which lights are considered intense enough to be used as task lights and which are suitable only as accent lights. The lights were tested at a distance of 18” above a work surface, which is the typical height of a standard kitchen upper cabinet above a counter top. Keep in mind that as the distance increases or decreases from the 18” used in the test, the light intensity will increase or decrease respectively. 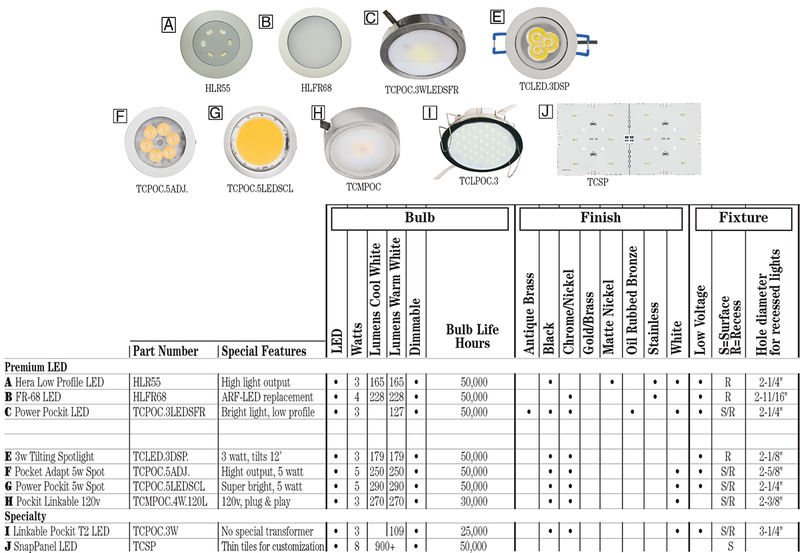 Look for individual Lumen ratings in the charts to compare intensity from fixture to fixture. In this guide, we’ll focus on comparing four very popular light bulbs; LED, Xenon, Halogen (premium and economy) and fluorescent bulbs. The Chart below grades each bulb based on three different categories, each with their own different measures of quality. 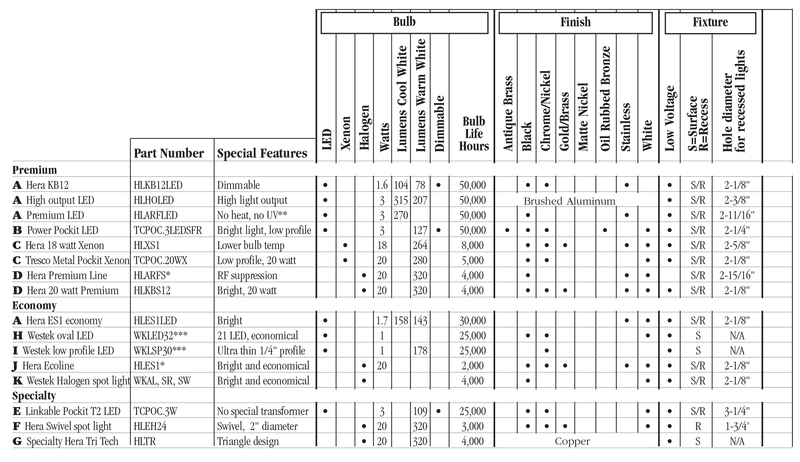 Refer to the descriptions below the chart for more information on each specific type of bulb. LED (Light Emitting Diode) – These light fixtures are steadily taking the lead in kitchen cabinet and furniture lighting applications. They are incredibly efficient and emit virtually no heat as 80% of their consumed energy is used for light. These lights are generally more expensive than halogen or xenon lights, but the fact that they operate at full brightness for up to 50,000 hours and use only 1 watt of energy per diode mean they pay for themselves many times over. Choosing these lights will help both the environment and your pocketbook in the long run. Xenon – These light bulbs don’t have any filaments inside them. Instead, light is created by an electrical current channeled through xenon gas in an arc. These light bulbs last much longer than halogen lights (up to 8,000 hours of lamp life), use less energy, but cost a little more than an economy halogen light. Xenon bulbs have medium to high heat emission levels. Halogen – These light bulbs are brighter and last longer than incandescent light bulbs. They also last up to 10 times longer than fluorescent bulbs. A halogen bulb is actually similar to an incandescent bulb except that halogen gas in the bulb rejuvenates the filament and keeps soot from being deposited on the insight of the bulb. These bulbs are generally less expensive than LED’s and have lamp lives of up to 4,000 hours. One disadvantage of these bulbs is that they burn very hot and may not be a good fit in some applications. Fluorescent – These light bulbs convert electrical power into useful light more efficiently and cooler than an incandescent lamp. That’s because the actual light is produced by electricity exciting mercury vapor in a glass tube. The lower cost of energy usually offsets the higher initial cost of a fluorescent fixture. Smaller compact fluorescent lights (CFL) have been developed sizes that make them popular for use in display cases, kitchen cabinets and furniture. However, because of mercury in the light, it’s important to remember that fluorescent lights must be segregated from general waste for recycling. The two sections below group lights based on their style and their function. There are two categories of lights, spot lights and strip lights, and both of these categories is split into task and accent lights. This will allow you to choose the perfect lighting for whatever cabinet or furniture application you're working with. Spot lights are an excellent choice for task and accent lighting in both cabinets and furniture. They come in a number of different finishes, including satin nickel and oil rubbed bronze, which allow them to match popular plumbing fixtures and decorative hardware in kitchens and bathrooms. They're easily surface-mountable, which is desirable in retro fit applications. Plus, you can drill holes for flush mount fitting in new construction situations. Spot lights are also nice for commercial displays and store fixtures and are available in dimmable LED technology, the new standard for cabinet and furniture lighting. Strip lights have many uses in homes, retail and institutional applications. They're available in fluorescent and, very popularly, dim-able LED versions. These lights are generally hidden buy a lip on upper cabinets/shelving or tucked into toe kick areas for task or accent applications. The strips can be directly linked together or linked with optional connecting cables. This makes them a popular choice for long runs of under shelving lights and in long display cases. If interested in Strip Lights, you may also be interested in the LED flex tape, which is a flexible adhesive-backed strip with LED’s set about ¾” apart from each other. These work great for curved surfaces or under treads for staircase lighting.